The 17-year-old is facing two murder charges. A teenage boy has been charged in the shooting deaths of Buckley Kuhn-Fricker and her husband, Scott Fricker. RESTON, Va. (AP) — A teenager has been charged with fatally shooting a couple in their northern Virginia home. Police say the 17-year-old shot himself after shooting the couple and is hospitalized in life-threatening condition. Police in Fairfax County, a Washington suburb, announced Saturday they filed charges against the teen. His name wasn't released because of his age. 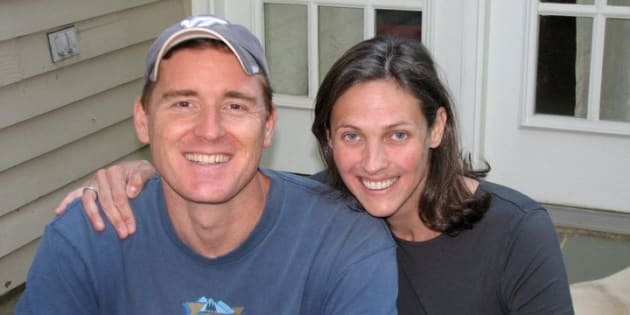 Forty-eight-year-old Scott Fricker and his wife, 43-year-old Buckley Kuhn-Fricker, were shot Friday in their home in the community of Reston. Police say the teen knew the victims, who confronted him when he entered their home. Police say the teen then shot the couple and himself. The Washington Post reported Saturday the suspect had been dating the couple's daughter, but that the family had recently persuaded her to break up with him because he espoused neo-Nazi philosophies. Kuhn-Fricker wrote to the teen's principal after she found a Twitter account that she believed was his, the Post reported. Tweets from the account called for a "white revolution," made derogatory and threatening comments about Jewish people and gay men, and supported Nazi book burnings. The mother wrote that her daughter had said her boyfriend knew a lot about history and asked the family, "Did you know Jews were partly to blame for WWII?"